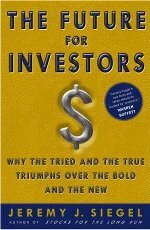 Looking for some highly recommended investing books? 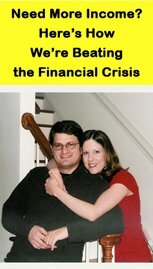 The following books have a lot in common with the business and investing philosophy promoted on this site. I've provided Amazon links for each one so that you can read other reviews, learn more, and maybe purchase these books. So take advantage of this wonderful depository of knowledge! No book review can adequately convey the true value of this book. 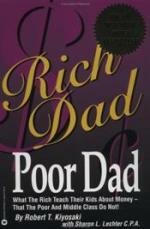 Rich Dad, Poor Dad is told like a story, chronicling the early life of investor Robert Kiyosaki as he learns money management lessons from two dads... his real father (Poor Dad) and his friend's father (Rich Dad). Rich Dad takes Robert under his wing and teaches him to think differently about wealth and money. Reading this book is one of the best investments you'll ever make, because the lessons you learn (if you apply them) will lead to tremendous wealth over the course of your life. An asset puts money in your pocket; a liability takes money out of your pocket. These are far different definitions than you'll ever find in any accounting textbook. But, if all you ever do is remember an asset puts money in your pocket, while a liability takes money out, then your financial life becomes so much easier. Simply collect assets and avoid liabilities! 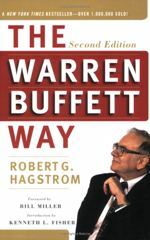 This classic investing book attempts to place the reader in the mind of the world's greatest investor, Warren Buffett. In so doing, it serves as a good introduction to the man and his career. 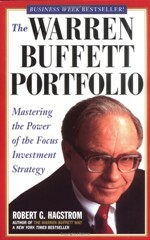 Concentrating on Buffett's investment style, the book outlines the types of companies he looks for (consumer-monopolies), the calculations he uses to determine a company's value (intrinsic value calculations), and the type of earnings history he looks for in a common stock investment (consistent and increasing). Even the most seasoned investors need to review these basic investment fundamentals, and the book serves as a solid foundation of information on equity investing for that reason alone. The author sets out to prove that Mark Twain was a stock market wizard when he said "put all of your eggs in one basket, and guard the hell out of that basket!" This book directly confronts the premise that a proper portfolio must be "diverse." That is, it must include 40 to 100 different companies in order to remain "safe" and avoid a significant capital loss. However, while such a notion may decrease short-term market volatility, it doesn't necessarily increase returns or safeguard an investor against loss. The book delves into Warren Buffett's comments on diversification, such as "knowledge decreases risk, not the number of stocks in your portfolio". Such a common sense approach flies in the face of conventional wisdom. After all, which is better... To own a few companies you know everything about, or many companies you know little or nothing about? The less you know about a company, the more likely it is that an unforeseen event will take place and hammer your portfolio. The book also addresses the fallacy of "re-balancing a portfolio". Again, the book asks, why sell off your best performing companies to buy a bunch of under-performing companies? Such a line of thinking is akin to saying, "Michael Jordan takes too many shots and makes too much money relative to the other players on his team, so he should be traded to another team for three players so as to decrease the risk of an injury hurting the team." Or, along a similar line of thinking, "we should give more shot opportunities to players of lesser talent so that the team doesn't become dependent on Michael Jordan to win." The Bulls won six NBA titles relying on Michael Jordan, and many family fortunes have been built on the back of a single all-star company. So, the idea that diversification protects against loss or somehow improves investor returns just doesn't hold water. It's this willingness to confront conventional wisdom that separates this book from most in its genre. While most investment books focus on stock selection rather than portfolio size, this book points out the underappreciated performance of the latter. 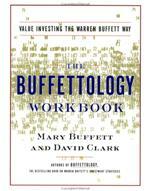 This book by Mary Buffett (former daughter-in-law of Warren Buffett) and David Clark (a portfolio manager) is similar to The Warren Buffett Way in that it attempts to provide some glimmer of insight into the investment philosophy of Warren Buffett. If you read only one book on stock market investing, then you could do far worse than reading this one. The book covers some extremely important concepts, such as investing from a business perspective and the myth of portfolio diversification. However, the book also covers by far the most important investment concept of all... the price you pay determines your rate of return. In the end, it doesn't matter how well researched your investment is or how great the underlying business is. If you pay too much for future earnings, then your investment returns will be mediocre. But if you pay a discount price, even a mature low-growth business can provide superior investment returns. This workbook is a supplement to Buffettology, and it's actually one of the best investments I've ever made. I bought it in a North Carolina thrift store for fifty-cents, and it later led me to reading the original book. While the book provides a more complete overview of Warren Buffett's investment style, the workbook focuses on practicing some of the mathematical calculations he uses to determine the value of a business. The financial formulas you'll find in this book are the same ones they should teach in business schools, but don't. The workbook is comprised of 23 chapters, each no more than a few pages, so you can read a chapter a day (and continue to review the chapters for the rest of your investing career). The first seven give a breakdown of Warren's investment philosophy, reiterating many of the concepts tackled in Buffettology. Once you understand these concepts, you've won half the battle of investment success. Now, you need to learn how to identify the correct buying opportunity. That's where the true value of this book comes into play, offering formulas and equations you won't find most books. The remaining chapters focus on the examination of financial statements, the acquisition of pertinent information (what's important and what's not), and how to determine an investment's desirability. You'll learn the value of high rates of return on shareholder equity, how to measure management's ability to utilize retained earnings, and Warren's ideas for the Internet and short-term arbitrage commitments. I read this book beginning to end on day one, but I'll continue to familiarize myself with its formulas for the rest of my life. Although it marks only the beginning of a person's investment knowledge, learning these bedrock principles separate the successful investors from the average ones. The subtitle of this book "Why The Tried And The True Triumph Over The Bold And The New" is far more indicative of its content. Readers of this book receive a vivid illustration of the investment principle "the price you pay determines your rate of return." The author examines the last century of investment history and arrives at some surprising conclusions. Oftentimes, the best investment returns are found in the slowest growing industries. Because overly optimistic market expectations of high-growth companies and business sectors drive up their prices to unrealistic levels. On the flip side, the market often pessimistically prices low-growth companies and business sectors, setting them up to beat market expectations on a consistent basis. The book also examines the top firms from the original S&P 500, ranking them according to average annual compounded rate of return. The top firms are all household names, such as Philip Morris, Abbot Labs, Tootsie Roll, Coca-Cola, Pepsi, Colgate-Palmolive, Wrigley, and Kroger. Moreover, these returns were achieved long after most of the public became aware of the superior characteristics of these businesses. This clearly illustrates that over a long time period, a person with patience and common sense is capable of beating the market averages by simply investing in excellent businesses at reasonable prices.